Tea tree oil, known as the volatile essential oil, is native to Australia and comes from the Melaleuca Alternifolia plant which is part of the Myrtaceae family. There are over two hundred species in the Myrtaceae family, all of them being native to the Oceania continent. Tea tree oil has been used for hundreds of years, both by locals and medical researchers, has been found to contain over one hundred different chemical components, and was found to be a powerful disinfectant by the British Medical Journal. The oil is commonly used to kill off strains of fungi, bacteria, and viruses and can be used to topically heal skin, treat viral infections, and kill off the mold. On today’s market, you can buy tea tree oil in an undiluted form or you can get it in a diluted form which is what is used topically on the skin. Let’s explore popular tea tree oil uses and the benefits they pose. 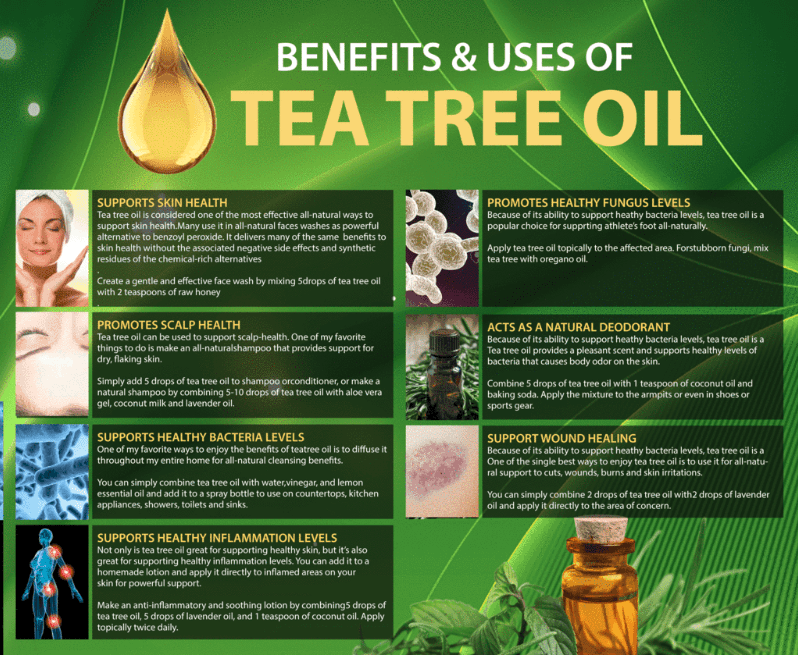 What Type of Health Benefits Can You Derive From Using Tea Tree Oil? ⦁ It can treat skin conditions like Psoriasis and Eczema. Individuals who are suffering from skin irritations can find relief with tea tree oil by massaging it into the irritated areas of skin. Not only will it help reduce the inflammation present but it will reduce how itchy the areas are. To use tea tree oil in this way, you take a few drops of it and place it in a carrier oil, such as coconut oil, and mix. Once mixed, apply topically and enjoy the relief. ⦁ Drop the chemical filled deodorants. For most of us, using deodorant is essential to not smelling bad throughout the day, but for those who are worried about the chemicals in generic deodorant options, it can be stressful to apply to our underarms. Although there are plenty of natural deodorant options out there, they can be pricey and tea tree oil is a great substitute which has many more options you can use it for, making it a cheaper choice. Tea tree oil has antibacterial properties that help control the odor that is related to the secretions you get from your sweat glands. ⦁ Tea tree oil uses to kill off minor infections. You can speed up the recovery of minor cuts by topically applying tea tree oil to the wound, similar to how you would apply it to the skin for skin conditions. Due to tea tree oil’s antiseptic properties, it can also be used to kill off minor infections. ⦁ It can treat unsightly nail fungus & athlete’s foot. For individuals who do not want to use anti-fungal medications to relieve the cracking, redness, peeling, and blisters from athlete’s foot, you can use tea tree oil as an alternative. It relieves skin scaling, brings down inflammation, and removes any itching feeling you may have. Although it cannot get rid of the actual fungus produced by athlete’s foot, it does an excellent job of treating the subsequent symptoms. To use it in this way, simply combine twenty or so drops of tea tree oil with 1/4 cup of baking soda and 1/4 cup of arrowroot powder, combine and apply to feet twice a day. As a side note, for those who have nail fungus, tea tree oil can be used to get rid of it, however, it does take daily use over the course of six to twelve months. ⦁ Pure tea tree oil can be used to treat your acne issues. Tea tree oil is one of the most commonly prescribed natural options for those who are suffering from severe acne. It is just as effective as the current medical treatment of benzoyl peroxide but does not include the side effect of red, peeling skin. Keep in mind though, it can take longer for tea tree oil to work. You can mix it with raw honey or benzoyl peroxide solutions to make it stronger. ⦁ Pure essential tea tree oil uses to soothe several types of skin inflammation. Whether you have skin inflammation from allergies, have been bitten by a bug, or are flaring up due to underlying medical causes, tea tree oil can reduce any redness and swelling that you have. To use it in this way, simply combine ten to fifteen drops of tea tree oil with extra virgin olive oil and melted coconut oil (carrier oil). Mix it and apply to the affected area twice a day until your symptoms go away. Regularly using tea tree oil in your hair when you shower can drastically reduce dandruff episodes. Beyond reducing how often your head gets flaky, it can also reduce how itchy your head is and how greasy it appears. To use it in this way, simply add two to five drops to your shampoo dollop during your bathing time. A bonus, tea tree oil works great against head lice as well! ⦁ Drop the chemical mouthwash. If you honestly are looking for an alternative for your generic brand of mouthwash, try using tea tree oil. Although it doesn’t fight against plaque formation, it is effective against plaque-causing bacteria and can help with tooth decay and bad breath. The only thing to watch out for here is that it cannot be ingested as it is toxic. ⦁ Create a natural toothpaste with it. Just like the natural mouthwash option, you can create a homemade natural toothpaste out of tea tree oil. It can help reduce bleeding gums, tooth decay, and bad breath. Simply mix a few drops of it with a carrier oil, like coconut oil, and a few spoonfuls of baking soda. Mix and place in a tube for easy use. ⦁ It can combat oily skin. Due to the antiseptic properties in tea tree oil, it can be used to help combat oily skin over the course of a few months with regular, general use. To use it in this way, simply add a few drops to your moisturizer, sunscreen, or toner and apply as you usually do. If you are into making masks for your face, you can always take a few drops of tea tree oil and add it to bentonite clay, mix, and apply. ⦁ Use it as an insect repellent. Nothing is worse than getting bitten by dozens of insects while you try to enjoy your summer bonfire night. Tea tree oil can help keep the insects away as it contains DEET, a common ingredient found in regular department store insect repellent. ⦁ Chuck those chemical cleaners. 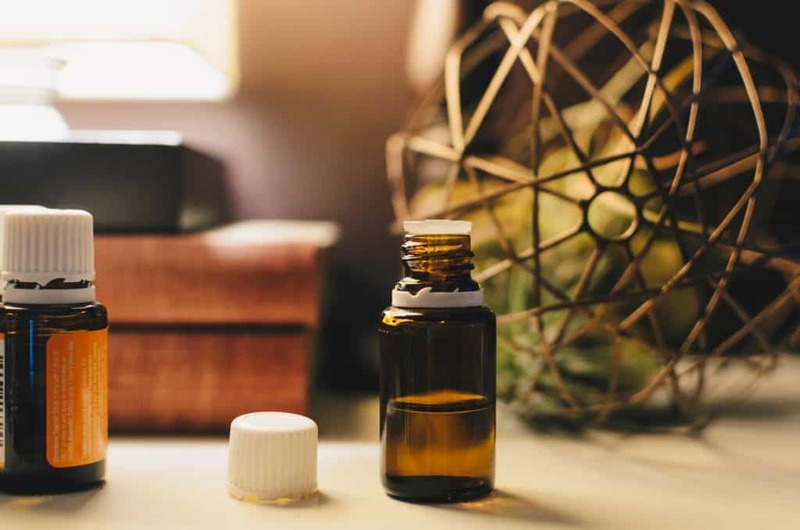 Whether you just don’t want to spread chemicals around your home or have pets that you are trying to keep healthy, tea tree oil is a great alternative to those chemical cleaners you have under your sink. It can be used as a general all-purpose cleaner for surface sanitation by mixing it with water and apple cider vinegar. Simply take twenty to thirty drops of tea tree oil, mix it with one cup of water and half a cup of apple cider vinegar. ⦁ Moldy Fruit? You can protect your fruit and vegetables from mold growth by spraying them with pure tea tree oil’s anti-fungal properties. Simply take five to ten drops, place it in the water you will be using to rinse your fruits and veggies, and wash. Dry after rinsing. ⦁ You can sanitize your hands with it. Tea tree oil is known to kill off commonly found bacteria on the hands that are responsible for serious viruses like E. Coli, Influenza, and Pneumonia. The only thing you need to keep in mind when using tea tree oil is that it is only safe when applied topically or aromatically through a device like a diffuser. If tea tree oil is ingested at all or gets into the body in its undiluted form, it can make you incredibly ill as it is toxic to the human body. This is why it must be kept away from the eyes, the inner nose, and other items like contact lenses and eye seeing glasses. When buying tea tree oil, topical products will come with five to ten percent, which will not cause a reaction, however, any concentration above this can cause a skin reaction. Generally, you should always do a skin patch test on one of your limbs before using it anywhere else on the body. You can check here to learn more, how does it work. When you go to buy pure tea tree oil in its undiluted form, always purchase a 100% pure essential oil that has the species name written on the back of the bottle, as this will ensure that you are not getting a knock-off that is going to cause harm. If you can, buy only therapeutic or organic grade oils and make sure that it is free of chemicals, solvents, and fillers. We love to be your ally on topic tea tree oil. Doing a lot of deep research on tea tree oil before publishing on our website. We are a passionate group of people who love to give valuable insight into the natural tea tree oil.